Two new Canon bridge cameras star among a flurry of compact cameras revealed today. The PowerShot SX540 HS (above) and PowerShot SX420 IS feature 20.3-million-pixel and 20MP imaging sensors respectively. Due out this month, the SX540 HS carries a DIGIC 6 image processor and a 50x optical zoom (24mm at the wide end) in an outfit priced £299.99. Boasting ‘incredible low-light capabilities and full creative control’, the SX540 HS also features an improved Zoom Framing Assist Lock function – engaging a stabilisation mode designed to allow users to easily frame their subject while keeping the camera centred and in focus. Other features include full HD video and 5-axis Dynamic IS. 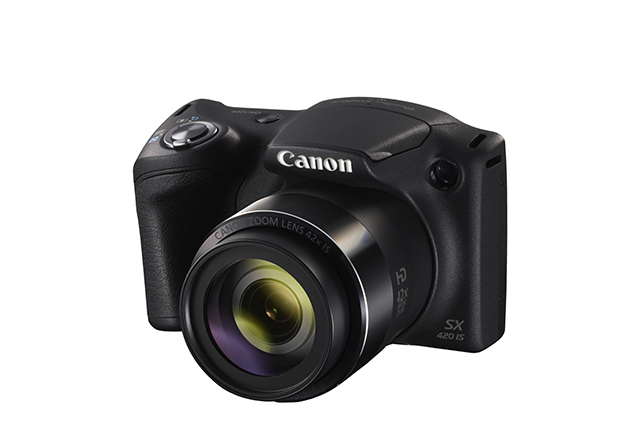 Meanwhile, the ‘pocketable’ PowerShot SX420 IS (below) sports a 42x zoom, a DIGIC 4+ processor and a 3in LCD screen. Due this month, the PowerShot 420 IS costs £219.99. Canon today adds two new superzoom compact bridge cameras to its PowerShot range – the PowerShot SX540 HS and PowerShot SX420 IS. The PowerShot SX540 HS boasts incredible low-light capabilities and full creative control to make the best use of its powerful 50x optical zoom and ultra-wide angle lens. The PowerShot SX420 IS offers an impressive 42x zoom lens, 20-megapixel sensor alongside a DIGIC 4+ and a range of automatic and simple creative features as well as Wi-Fi with Dynamic NFC for easy sharing. The PowerShot SX540 HS features the power of a DIGIC 6 processor and a 20.3-megapixel CMOS sensor, ensuring all your memories are captured with incredible clarity. The high-sensitivity sensor also gives you amazing low-light shots, and the 50x optical zoom allows you to get close to the action and capture intricate detail. With ZoomPlus you can also digitally double your zoom without losing resolution, so whether it’s distant buildings or shots from the back of a stadium, nothing is out of reach. To ensure you keep track of your subject when using long zoom, improved Zoom Framing Assist Lock engages a stabilisation mode, allowing you to choose and frame your subject easily whilst the camera intelligently keeps your it centred and in focus. For impressive cityscapes and sweeping vistas, the 24mm ultra wide-angle lens helps you fit more in to every shot, perfect for sharing your travelling memories with friends and family. For budding movie makers, the PowerShot SX540 HS shoots Full HD video in MP4, and uses 5-axis Dynamic IS to keep footage steady as you move and shoot. For movies you don’t have to think about, Story Highlights intelligently analyses your images and clips of a chosen date or person, stitching them together to create a movie memento to watch and share. Featuring a 42x optical zoom, ZoomPlus and an ultra wide-angle lens packed into a compact body, the PowerShot SX420 IS is the ideal camera for easily capturing every occasion – whether it’s everyday snaps or breath-taking travelling photos. Together the 20-megapixel sensor and DIGIC 4+ processor ensure image quality is not compromised, and thanks to Intelligent IS your images and HD movies are blur free, showing all the detail. With a host of Creative Filters, including Miniature Effect and Fish-eye Effect, you can capture unique creations in an instant. The 7.5cm (3.0in) LCD screen makes reviewing your movies and photos easy, while the ergonomic grip keeps your hand and subject steady in any situation. The cameras both have built in Wi-Fi and with Dynamic NFC allowing you to easily connect and share photos and movies to compatible smartphones, tablets or storage devices such as the Canon CS100, or even control the camera with Remote Shooting. The dedicated Wi-Fi button gives you a simple shortcut to connectivity features, helping you share as you shoot. For peace of mind, both cameras offer Image Sync, automatically backing up your photos and movies to cloud services like Canon’s irista or Google Drive as soon as they are connected the internet.